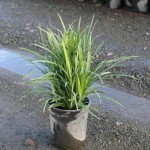 It is an evergreen perennial with arching, grass like foliage. It blooms in the summer with spikes of blue flowers that are followed by black berries. It prefers moist soils, however, it will take drought once established. It does well in shade to full sun. Use as an edging plant or massed as a ground cover.